Avoid information overload with these advanced techniques for using Reaper's mixer. If the amazing amount of content available on the Internet gives you a bad case of information overload, spare a thought for the engineer tasked with turning a huge number of tracks, effects, sends and automation into a finely mixed stereo master. Digital Audio Workstations offer incredible power and flexibility, but, packing so much information into one system (and often, one screen), they lack the 'all in one glance' comprehension factor of mixing on a hardware console. Fortunately, Reaper offers many features that can help you wade through the most complex of mixes, to tame the flood of information so that you can concentrate on the sound. By default, the mixer loads in the Docker, at the bottom of the main Reaper window. The Docker provides a convenient method of navigating between docked windows, but its size is limited by the height of the main window (containing the tracks). If you're dealing with more than a handful of tracks, the docked mixer becomes crowded and you have to scroll to see everything that's going on. 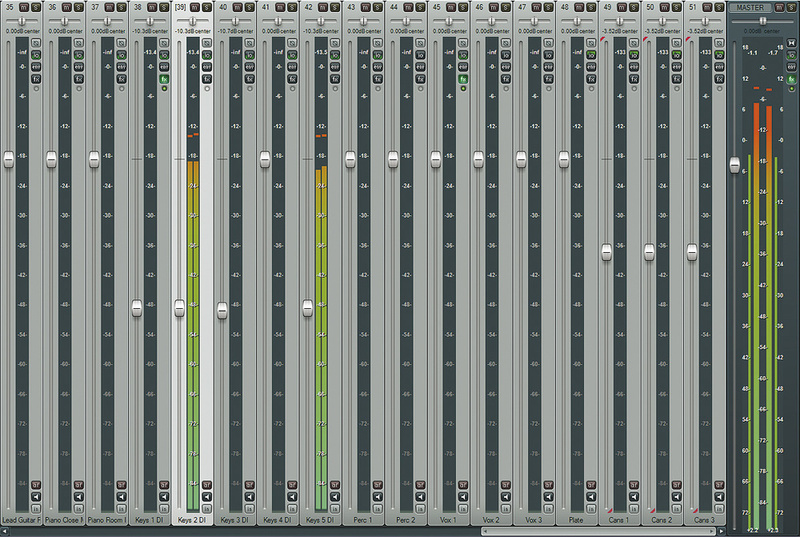 Additionally, sends and effects are usually hidden when the mixer is docked, due to the vertical height limitations. To give the mixer room to breathe, break it out of the Docker by right‑clicking on the Mixer tab and clearing the 'Dock Mixer in Docker' option. This floats the mixer in its own window. You can now double‑click on the window title bar to expand the mixer to full screen. If you're using a multiple‑monitor setup, you can also move the mixer to another monitor. Using the full screen for the mixer provides several benefits. Reaper's mixer automatically displays as many tracks as possible in the mixer window when the 'Show multiple rows of tracks when size permits' option is enabled. This is a great way to get a quick overview of all of the tracks in the session. If the number of tracks still exceeds the size of the window, a scroll bar appears at the bottom of the mixer so you can scroll to view the rest of the mix. 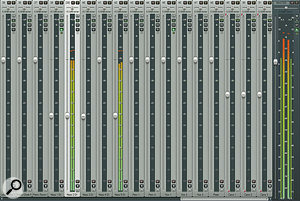 The number of mixer rows is determined by the window size, with the default row height showing the track name, meter, pan settings, track number, mute and solo buttons. 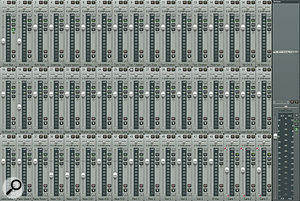 Undocking the mixer window gives you far more space to see what's happening in the mix. Now you have space to work with, let's look at some more of the features you can use to control what you see in the mixer window. Reaper's mixer comes with a number of display options enabled by default. To view these options, right‑click on the track name for the Master track, or in a blank space in the mixer window. Enabled options have a tick next to the option name. Clear the 'Show multiple rows of tracks when size permits' option. Instead of multiple rows with limited information, you'll now have a full‑height mixer channel for each track. Notice that the effects chain and sends for each track are now displayed above the meter area. You can control the display of these sections of the mixer through two more options. Using the full mixer height for your meters gives you greater detail — especially useful for quiet material. Open up the options list again and clear the option for 'Show FX inserts when size permits'. The space that was once taken up by the FX inserts can now be used to show more sends. Alternatively, you can hide the sends by clearing the 'Show sends when size permits' option, to show a large number of effects inserts. Finally, you can expand the space for the track meters to full height by clearing both of these options. A full‑height mixer channel can show everything that's happening in the track. By default, the meters only display levels above ‑62dB. This setting, and the range of the meters, can be adjusted to suit your source material by changing the Meter minimum value (dB) setting in the Appearance / VU Meters / Faders section of the Reaper Preferences. This is particularly useful when you're using the full height of the screen for the meter. You can use the next two options to hide the tracks within a Folder, any track that is a Folder track, or both, greatly increasing the available space for the remaining tracks. To hide tracks that are part of a Folder, clear the 'Show tracks that are in Folders' mixer option. By just hiding the Folder tracks, we've already removed an entire row from the mixer display, increasing the height of the mixer channels and revealing the inserts and sends in the remaining tracks. You can go further and hide the Folders themselves, by clearing the 'Show Folders' option, but be careful, because the Folder and Folder Tracks options are not linked. It can quickly get confusing if you show the Folder Tracks again but forget to show the hidden Folders as well. 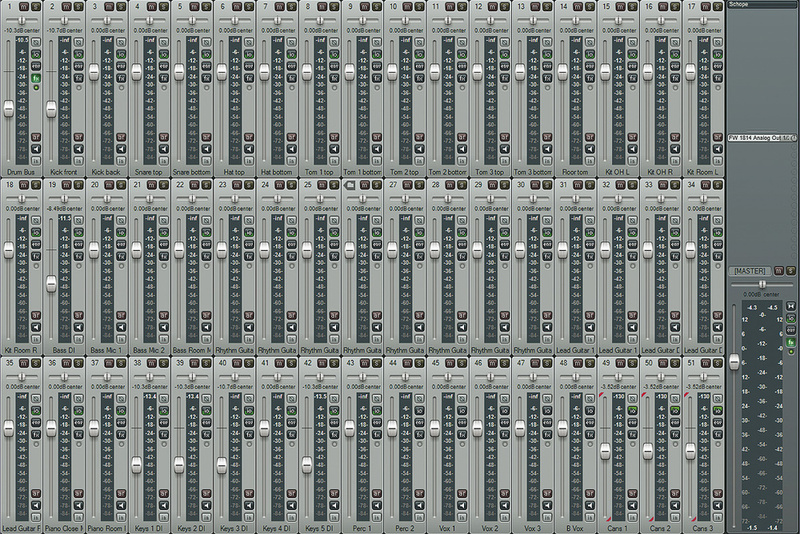 If you have enough space, it's usually best to leave the Folders visible in the mixer. These mixer options affect every Folder (and their tracks) in the mixer. If you only want to hide the tracks in certain Folders, you can toggle their visibility by clicking on the Folder icon for the selected Folder. Additional show/hide options exist for the Master track, and any tracks that receive signal from another track (useful for showing/hiding aux tracks). • Part of a Folder. • Part of a group. • Receiving signal from another track. While the visible, default options provide a decent amount of control over the mixer, the real power lies beyond the visible menus, in Reaper's Actions. Actions tell Reaper to perform a particular function, or series of functions, and can be tied to a keyboard shortcut, or to a controller such as a MIDI keyboard or hardware mixer. You're probably already familiar with the keyboard shortcut Ctrl‑M (Mac: Cmd‑M), which opens or closes the mixer window. In the next part of this workshop, we'll create a custom set of shortcuts to quickly recall some of the default mixer views, and create a few new options to speed up the mix process. Open the Actions list by selecting Actions / Show Actions List, or by using the question mark (?) keyboard shortcut. Tell Reaper what to do with custom Actions. You can locate an existing Action by scrolling through the list, or by entering a keyword in the Filter field. Existing mappings are shown in the Shortcut column. The entire Actions list, or sections of it, can be exported or imported, so you can take your custom Actions and mappings to any Reaper installation. This is great if you need to work at different studios but want to retain your workflow between facilities. You can restore the mappings to their default state at any time by clicking on the Import/Export button, then selecting 'Restore all shortcut bindings to factory defaults'. Hidden away in the Actions list is one of my favourite mixer tools: the Filter Tracks function. 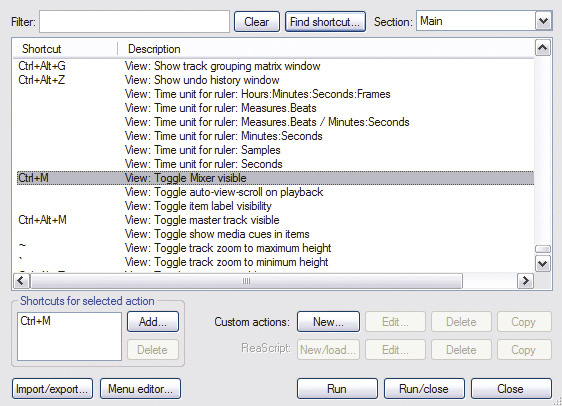 To locate this function, enter 'Filter' in the Filter field of the Actions window, then double‑click on the action called 'Filter track visibility' to open the Filter Tracks window. (Certain functions outlined in this article, such as Filter Track Visibility, may operate differently in Reaper 4.) This little gem is used to hide or show tracks based on keywords. Enter a keyword — for example, 'Guitar' — then select 'Show in mixer' or 'Hide in mixer' from the associated Actions list, to include or exclude any track that contains that keyword as part of the track name. With a bit of thought put into your track names, you can easily show or hide large sections of the mix using this simple tool. Small but powerful — the Filter Tracks window. Click the Add button in the 'Shortcuts for selected Action' section of the Actions window, and then press 1 on the number keypad. By default, this shortcut is already mapped to another Action. Since we'll be saving these assignments as a custom keymap, click OK to override the default settings. 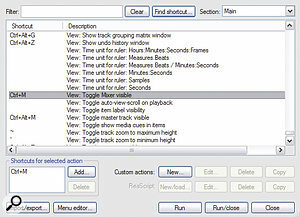 The assigned shortcut appears in the 'Shortcuts for the selected action' section of the Actions window, and also in the Shortcut column of the Actions list. Try pressing 1 on the number keypad and using the options in the Filter Tracks window to filter the tracks that are visible in the mixer. Open up the Actions list again, click Import/Export, and select Export All. Save the Actions list as Mixer.ReaperKeyMap, so you can recall the settings at any time. Next, let's map an Action that makes the management of Folder tracks a breeze. Enter the keyword 'Folder' in the filter field. Select the 'Cycle track Folder state' Action. Assign number 2 to this Action, then go back to the mixer. Select any track that is not part of a Folder, then click '2' on the number keypad. The track will cycle between a normal track and a Folder track each time you press the shortcut key. You can use the same shortcut to set the track that is the last track in a Folder. If you can't see the Folder icon, check that 'Clickable icon for folder tracks to show/hide children' is selected in the mixer options. Although you can use the default mixer options from the right‑click menu, assigning them to a shortcut speeds up the process considerably, and allows you to access them without having to use a mouse. You can assign the shortcuts you want to use to the remaining number keys; the table on the previous page shows the shortcuts and assignments that I regularly use. When you've finished creating your shortcuts, remember to save them to the Mixer.ReaperKeyMap file, so you can access them when you need to.